After a day of bouncing from one thing to the next, I rushed out of work to get home to cut my own grass and then my parents grass before the rain comes in tonight. Beat the clock before dark sets in, although I’ve been known to finish the grass in the dark. Some creative cut lines show up when morning comes. Lawn mower starts on second pull, headset on, ready to roll. When I went from the front to the backyard, Molly and Lily were wrestling and having a grand time. I started to laugh as they each positioned to take the other down. Their delight was contagious. It always is. I get into the groove and lighten up a bit. While it was a good day, my thoughts zoned in on the few difficult moments rather than the majority of good ones. Work thoughts quickly shifted to worries about a slew of family health issues ranging from hips to stage 4 breast cancer. 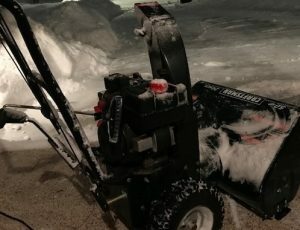 I got much more than the grass cut tonight for sure. There will be an answer, let it be. A few weeks ago on the national nightly news there was a “doing good” segment at the end, perhaps to balance the 25 minutes of “all that’s wrong with the world.” It was about a couple of college kids at St. Thomas University in Minnesota, so I perked up since my nephew graduated from there. 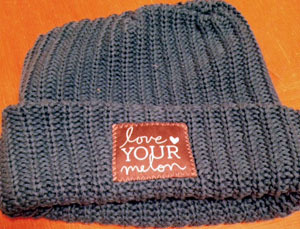 They had an idea and a few years later it’s now a 501(c)3 nonprofit called the Love Your Melon Foundation. Mission: To put a hat on the heads of all children battling cancer in America. How: You buy a hat (made in the USA to create jobs here) and they dress up as superheroes to deliver hats to kids going through cancer treatment. Buy a hat and one is given away. Simple and awesome. My hat came in the mail yesterday and I wanted to share so this idea can continue to cast light for kids battling cancer and to honor the perseverance of a couple of college kids who pushed this idea into reality. We all have the power to do good. And when the ideas and goodness in our hearts are set free, each of us can change the world one person at a time. That’s the real news. 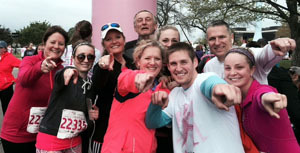 The sound of a text on the phone – a text from Linda today “Another year cancer-free. Hugs and kisses.” Today marks 15 years to the day I was called on Ash Wednesday, 1999 to be told that I had stage 3 melanoma. I had to be reminded. I forgot. She remembered. That’s what friends and family do – they remember, they celebrate, they hold up a mirror to show us the best of us – our soul, our spirit. We remember the offenses, we remember the struggles, we remember the day and minute we get the call. We need to remember the laughter, the lessons and the steps that lead us to the many victories, the celebrations. Tonight, I had dinner with family and played a little bingo. Laughing, winning the meat raffle twice and sharing special moments that make up a good life. 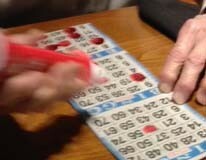 So as the numbers are being called, remember to yell “bingo” when you win. It’s more often than we count. We often get defeated by the day to day, the small. Harsh words from a customer. Work filled with unending unreasonable deadlines. We get lost in transactions, lists and the sheer volume of tasks, losing our humanity in the process. I started this blog to write more, to challenge my introverted self to open up and to search for the good in each day. We long to be lifted out of the small and to be cast into the moment, into the light. We have the power to shape our life and to encourage others along the way. The video below was made by the University of Minnesota Amplatz Children’s Hospital. The young lady in the beginning of the video and who has the courage to remove her wig in the middle is the daughter of my boss. She’s gone through a second round of treatment for a rare cancer. The bright beautiful smile you see in the video is who she is through and through, finding and giving joy despite the depth of her circumstances. The video was posted on October 7th on YouTube and now has 288,820 hits. Take a few minutes, turn up the volume and count your blessings. Be brave.